Facebook announced it’s acquiring positivity-focused polling startup tbh and will allow it to operate somewhat independently with its own brand. tbh had scored 5 million downloads and 2.5 million daily active users in the past nine weeks with its app that lets people anonymously answer kind-hearted multiple-choice questions about friends who then receive the poll results as compliments. You see questions like “Best to bring to a party?,” “Their perseverance is admirable?” and “Could see becoming a poet?” with your uploaded contacts on the app as answer choices. Financial terms of the deal weren’t disclosed, but TechCrunch has heard the price paid was less than $100 million and won’t require any regulatory approval. As part of the deal, tbh’s four co-creators — Bier, Erik Hazzard, Kyle Zaragoza and Nicolas Ducdodon — will join Facebook’s Menlo Park headquarters while continuing to grow their app with Facebook’s cash, engineering, anti-spam, moderation and localization resources. This isn’t quite right. I suspect TechCrunch, and whatever source they “heard” from, is referencing the Hart-Scott-Rodino Antitrust Improvements Act. In order to reduce the burden on the Fair Trade Commission and the Antitrust Division of the Department of Justice, an acquirer only needs to report acquisitions (and wait for a specified time period to give time for review) for which the total value is more than a specified threshold; for 2017, that threshold is $80.8 million. To that end, I wouldn’t be surprised if this deal is worth approximately $80.7 million; that would mean Facebook doesn’t have to submit this acquisition for review. However, just because Facebook doesn’t have to submit this acquisition for review doesn’t mean it can’t be reviewed; indeed, in a closely-watched case from 2014, the FTC successfully sued to undo a $28 million acquisition that had already been consummated. That was only one of many acquisitions the FTC has investigated that didn’t cross the Hart-Scott-Rodino threshold; in most cases the FTC acted in response to complaints from customers or competitors. Might an analyst complain as well? The FTC can, and should, investigate this acquisition. 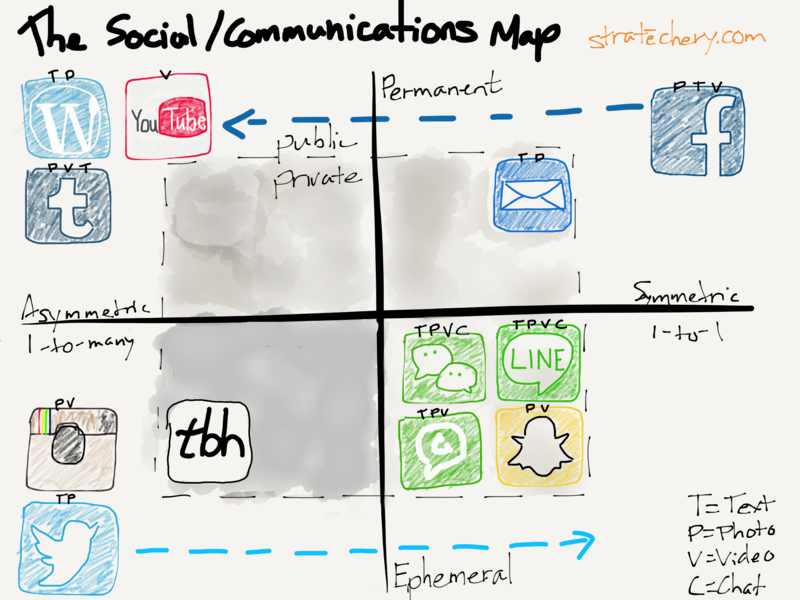 The goal of this map was to show that there was no single social app that covered all of humanity’s social needs: there were critical differences in how people perceived1 different social apps, and that no one app could fill every part of this map. Facebook, for its part, had, for better or worse, transitioned to a public app that not only handled symmetric relationships, but, at least according to perception, asymmetric broadcast as well; that, though, left an opening for an app like Snapchat. Thus Facebook’s acquisition drive: the company had already secured Instagram, giving it a position in asymmetric ephemeral broadcast apps; Snapchat rebuffed advances, so the company soon moved on to WhatsApp. The importance of these two acquisitions cannot be overstated: Facebook has always been secure in its dominance of permanent social relationships, a position that has given the company a dominant position in digital advertising. However, while everyone may need a permanent place on the Internet (all of those teenagers people say Facebook needs to reach have Facebook accounts), the ultimate currency is attention, and much like real life, it is ephemeral conversation that dominates. Facebook, by virtue of early decisions around privacy and significant bad press about the dangers of revealing too much, was locked out of this sphere, so it bought in. The Commission has been conducting an investigation to determine whether the proposed acquisition of Instagram, Inc. by Facebook, Inc. may violate Section 7 of the Clayton Act or Section 5 of the Federal Trade Commission Act. Upon further review of this matter, it now appears that no further action is warranted by the Commission at this time. Accordingly, the investigation has been closed. This action is not to be construed as a determination that a violation may not have occurred, just as the pendency of an investigation should not be construed as a determination that a violation has occurred. The Commission reserves the right to take such further action as the public interest may require. “Lessen competition” is exactly what happened. Instagram, super-charged both with the Facebook social graph and the Facebook ad machine, is not only dominating its native ephemeral asymmetric broadcasting space but increasingly preventing Snapchat from expanding. WhatsApp, meanwhile, dominates the messaging space across most of the world,2 and is the most prominent arrow in Facebook’s “future growth” quiver. The consolidation of attention has translated into dominance in digital advertising. Facebook accounted for 77% of revenue growth in digital advertising in the United States in 2016; add in Google and the duopoly’s share of growth was 99%. Even Snapchat, which after rightly rebuffing Facebook’s acquisition offers, IPO’d earlier this year for $24 billion,3 has seen revenue declines, all while Facebook ever more blatantly rips off the product. The FTC’s response to the WhatsApp acquisition is more interesting: there the agency’s focus was privacy, specifically insisting that Facebook not change WhatsApp’s more stringent promises around user data without affirmative consent from users. This followed a few years after Facebook’s consent decree with the FTC that demanded the company not share user data without their permission. There’s just one problem: whatever limitations this consent decree may have placed upon Facebook, the reality is that the company is a self-contained ecosystem: prohibiting the permissionless sharing of personal information in fact entrenches Facebook’s position. Take, for example, Europe’s vaunted GDPR law: as I explained in the Daily Update, data portability that, for privacy reasons, excludes the social graph (because your friends didn’t give you permission to share their information with other services) makes it that much harder for competition to arise. So it was with the FTC’s restrictions around the WhatsApp deal: the agency reiterated that Facebook couldn’t violate user’s privacy, and completely ignored that the easiest away around privacy restrictions is to simply own all of a user’s social interactions. Perhaps the most fanciful regulatory document of all, though, is not from the FTC, but rather the United Kingdom’s Office of Fair Trading. Its review of the Instagram deal rested on its analysis of Facebook Camera, an app that no longer exists. There are several relatively strong competitors to Instagram in the supply of camera and photo editing apps, and those competitors appear at present to be a stronger constraint on Instagram than Facebook’s new app. The majority of third parties did not believe that photo apps are attractive to advertisers on a stand-alone basis, but that they are complementary to social networks. The OFT therefore does not believe that the transaction gives rise to a realistic prospect of a substantial lessening of competition in the supply of photo apps. This bit, five year on, still leaves me speechless: Instagram didn’t generate advertising revenue because that’s not how social networks work. As Mark Zuckerberg frequently explains, there is a formula for monetization: first grow users, then increase engagement, next attract businesses, and finally sell ads. Just because Instagram, at the time of this acquisition, was still in Stage 1, did not preclude the possibility of Stage 4; the problem is that the Office of Fair Trading simply had no idea how this world worked. The issue is straightforward: networks are the monopoly makers of the Internet era. To build one is extremely difficult, but, once built, nearly impregnable. The only possible antidote is another network that draws away the one scarce resource: attention. To that end, when it comes to the Internet, the single most effective tool in antitrust regulation is keeping social networks in separate competitive companies. That the FTC and Office of Fair Trading failed to do so in the case of Instagram and WhatsApp is to the detriment of everyone. tbh is hardly the only contender: Secret and Yik Yak were others. Secret failed due to the lack of an organizational mechanic and negativity; Yik Yak fixed the former by utilizing location, but suffered from the same negativity problem. tbh has clearly learned lessons from both: the app leverages both location and your address book as an organizing mechanic, and is engineered from the ground-up to be focused on positivity. Moreover, it’s easy to see how it could be super-charged by Facebook: the social graph is probably even more powerful than the address book in terms of building a network, and provides multiple outlets for connections established on tbh. Just as importantly, Facebook can in the short term fund tbh and, in the long run, simply graft the service onto its cross-app sales engine. It’s a great move for both parties. What is much more questionable, though, is whether this is a great deal for society. tbh is, by definition, winning share in the zero sum competition for attention in the ultra-desirable teenage demographic in particular, and that’s good news for any would-be Facebook competitors. Why should it be ok for Facebook to simply swallow up another app, small thoughh it may currently be? Again, simply looking at narrowly-defined marketshare estimations or non-existent revenue streams is to fundamentally misunderstand how social networks work. Facebook should not be allowed to buy another network-based app; I would go further and make it prima facie anticompetitive for one social network to buy another. Network effects are just too powerful to allow them to be combined. For example, the current environment would look a lot different if Facebook didn’t own Instagram or WhatsApp (and, should Facebook ever lose an antitrust lawsuit, the remedy would almost certainly be spinning off Instagram and WhatsApp). The FTC dropped the ball with Instagram and WhatsApp; absent a time machine, the best time to do the right thing is right now. 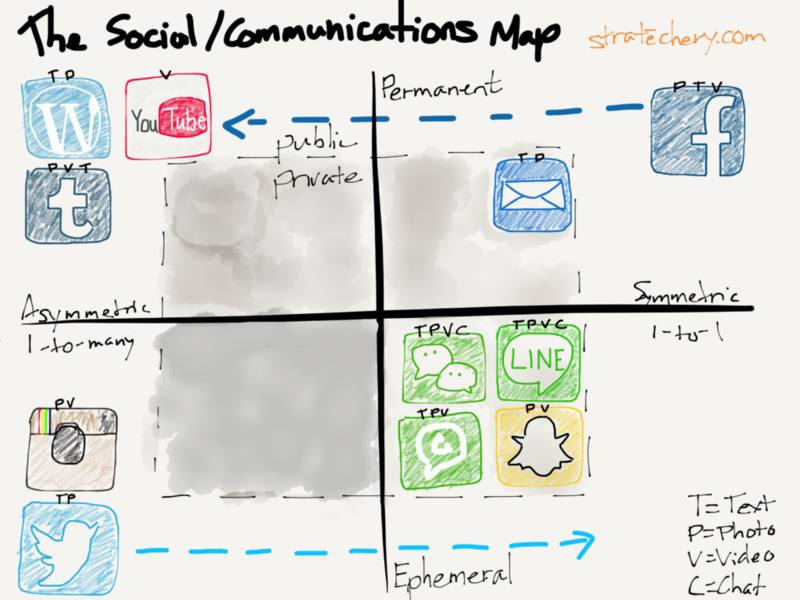 All social networks should be required to enable social graph portability — the ability to export your lists of friends from one network to another. Again Instagram is the perfect example: the one-time photo-filtering app launched its network off the back of Twitter by enabling the wholesale import of your Twitter social graph. And, after it was acquired by Facebook, Instagram has only accelerated its growth by continually importing your Facebook network. Today all social networks have long since made this impossible, making it that much more difficult for competitors to arise. Requiring Facebook to offer its social graph to any would-be competitor as a condition of acquiring tbh would be a good outcome; unfortunately, it is perhaps the most unlikely, given the FTC’s commitment to unfettered privacy (without a consideration of the impact on competition). What shouldn’t be allowed is what Facebook clearly hopes — and suggests — will happen: no regulatory review at all. The FTC has the power, and it’s time to use it.